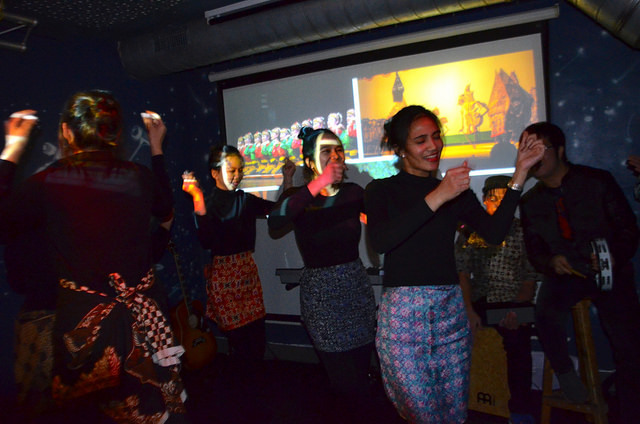 Intercultural Night: Indonesia – ISWI e.V. Which country has the second longest coastline? Where is the home of the Komodo dragon? Where do people love to take pictures together? And where is a must-visit? What surprises the world’s largest island state has to offer was revealed in the bi-club on 26th November 2018. The colourful country was presented in a lively atmosphere not only through a multi-layered picture presentation. Immediately after entering the club one found oneself in another world. The 200 to 300 visitors could marvel at the colourful world right at the beginning through a fashion show (an ideal opportunity to find out what is behind the words Kebaya and Sarong) and a dance group. Or maybe it was the smell of the steaming chicken noodle soup “Soto Ayam” that lured the enthusiastic audience into the crowded bi-club. Not to mention the rush for the coveted dessert “Wedang Jahe”. The evening was a wonderful insight into a country full of different cultures and adventures. Even some Indonesian students took new insights with them. If you are now also feeling the urge to travel, visit the next intercultural night in April or ask your ISWI person of trust.